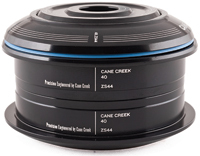 The all-new 40-Series replaces the S-Series and continues to be the work-horse of Cane Creek’s headset line-up. The series incorporates all the features necessary for a durable, light-weight, long-lasting headset and represents the perfect balance of performance, durability and value. The 40-Series is constructed out of 6061 T-6 Aluminum that is internally relieved to reduce weight. Features dependable black-oxide, sealed bearings. Available in Integrated and ZeroStack compatibility. 1-1/8″ steerer tubes only.